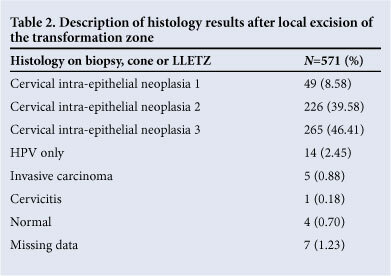 Cervical intra-epithelial neoplasia in HIV-positive women after excision of the transformation zone - does the grade change? OBJECTIVE: After previously reporting the presence of disease by cytology findings after treatment for cervical intra-epithelial neoplasia (CIN) in 64.6% of HIV-infected women and in 13.0% of HIV-negative women, we aimed to determine the severity of cytological disease after treatment in HIV-infected women. METHODS: We studied HIV-infected (N=571) women treated at the Colposcopy Clinic at Chris Hani Baragwanath Hospital, Gauteng, between April 2003 and December 2006. We compared the initial histology results with Pap smears >6 months later, and evaluated factors associated with reduction in the grade of disease. RESULTS: Mean age was 36.68 (SD+7.33) years; mean parity was 2 (SD+1.46); mean CD4+ count was 242.70 cells/jd (SD+187.56); 262 (45.80%) were receiving antiretroviral treatment. 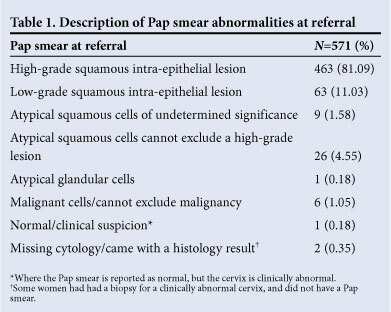 Persistent disease was detected on the repeat Pap smear in 199 (65.03%); of these, 223 (72.88%) were of a lesser grade than in the original histology results. Of the 152 with histologically confirmed CIN3, 67 (44.08%) had improved to a lesser grade, and 54 (44.63%) had normal cytology results. Among the latter two subject groups (n=141) who had CIN2 histologically, 91 (64.53%) had improved, 29 (20.57%) remained unchanged, and 20 (14.88%) had CIN3; 13 (4.25%) patients with CIN1 returned for follow-up; 11 (84.62%) of these had normal Pap smears and 2 (15.38%) had CIN3. CONCLUSION: Recurrences were of a lesser degree than initial histology results. This reduction in the grade of disease was related to CD4+ count, complete excision and parity. Antiretroviral therapy use did not improve outcome, perhaps owing to low initial CD4 counts. South Africa (SA) has a dual burden of cancer of the cervix and HIV infection.1,2 The prevalence of abnormal Papanicolaou (Pap) smears has been found to be up to 75% in HIV-positive women in Sub-Saharan Africa.3 Pre-malignant disease of the cervix is of a higher grade and progresses more rapidly in HIV-infected women. Women are referred to the Colposcopy Clinic from approximately 22 clinics in the Johannesburg metropolitan area. HIV-positive women with any abnormal cytology are referred. The Colposcopy Clinic is a 'see-and-treat' service where patients are offered immediate treatment at the time of the colposcopic diagnosis. Colposcopies are performed or supervised by experienced colposcopists. In view of the uncertainty of the natural history in HIV-infected women, our management in 2006 was more aggressive, and they were treated with large loop excision of the transformation zone (LLETZ) even when colposcopy suggested CIN1. HIV-negative women are treated with local excision when the Pap smear and colposcopy suggest CIN2 or more severe grades of disease. The referral Pap smears, demographic factors and histology results were described using frequencies for categorical variables, and means and medians for continuous variables. We then compared the histology results obtained at the time of initial treatment with Pap smear results performed at least 6 months later in those women who came back for follow-up. For the univariate analysis, the outcome we used was any reduction in the grade of disease or a normal Pap smear as the outcome. All Pap smears that were normal (CIN2 or less when the original histology was CIN3; or CIN1 when the original histology was CIN2) were classified as 'lesser grade of disease'. 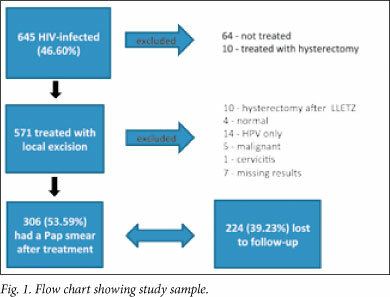 A logistic regression analysis was performed to evaluate factors associated with a lesser degree in the grade of disease or normal cytology results on Pap smear 6 months after treatment. Factors evaluated for association were age, parity, CD4+ count and the use of antiretroviral treatment (ART). A multivariate logistic regression analysis for all variables with a p-value <0.20 was also performed (results not shown). The assumption of linearity in the logit scale was also assessed and the Hosmer- Lemeshow goodness-of-fit test was used for model diagnostics. The following colposcopic diagnoses were made: 41 (7.18%) CIN1, 234 (40.98%) CIN2, 244 (42.73%) CIN3, 22 (3.85%) were suggestive of invasive or micro-invasive disease, 2 (0.35%) were normal, 1 (0.18%) condyloma; and data had not been recorded in 27 (4.73%). Fig. 2 shows the original histology results and the Pap smear result at follow-up. Of the women («=199(65.03%)) with an abnormal Pap smear at follow-up, most of the abnormalities were of a lesser grade; 111 (36.27%) had cytological abnormalities that required repeat treatment (HSIL-109, ASC-H-1, AGC-1). The remainder (195 (63.73%)) had a LSIL and were followed up with Pap smears. Initial management of LSIL included LLETZ because we were uncertain as to the rate of progress in women who were HIV infected. However, it became apparent at follow-up that progression was infrequent, and therefore continued observation with repeat Pap smears was a reasonable follow-up regimen. Factors associated with lesser grade or normal cytology are shown in Table 3. A parity of 1 - 2 was associated with twice the chance of having a lesser grade of disease compared with women with no pregnancies. 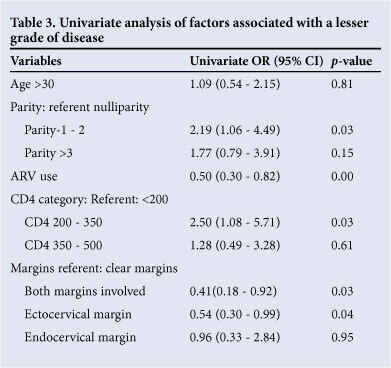 The use of ART reduced the chance of a 'lesser grade of disease' and this association remained in the multivariate analysis when controlling for CD4+ count (results not shown). However, we were unable to assess the length of time that patients were on ART. It may be that ART is commenced when the CD4+ count is already too low, and with more severe immunocompromise. A CD4+ count >200 cells/μ! was associated with lesser grade of disease at follow-up Pap smear, but was only statistically significant for CD4+ counts of 200 - 350 cells/μ!. Incomplete excision of the lesion reduced the chance of a lesser grade of disease on the repeat Pap smear. However, the association failed to reach significance when disease was present only at the endocervical margin. Abnormal cytology findings at follow-up in this HIV-infected population of women occurred in 65.03%, which is comparable to other studies.6,12 However, none of those studies evaluated the grade of the disease after treatment. Our study showed an encouragingly high rate of regression of the CIN (72.88%). 49.4% (unpublished data). Complete excision in this group of women was achieved in 38.33%. Note that these women might have been younger and desiring pregnancy, so extensive excision might not always be appropriate.